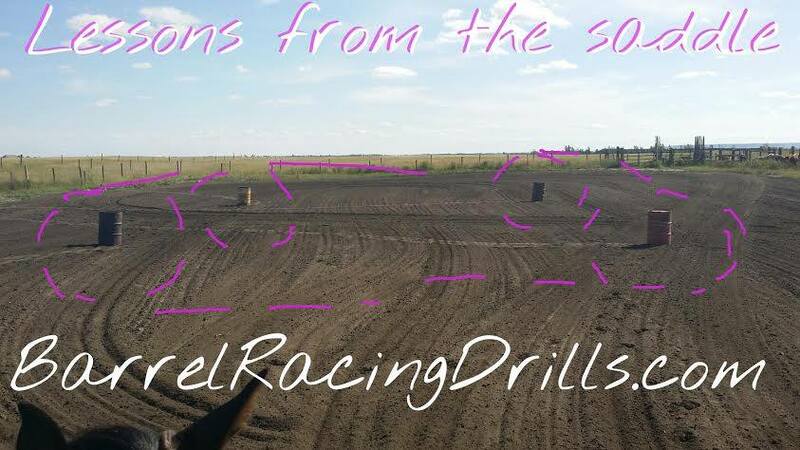 The coolest thing about this 4 corner barrel racing drill is that I videoed myself after this picture with a GoPro! (You can watch it if you are subscribed to BarrelRacingDrills.com ). It looks a bit distorted here due to being such a wide angle, but you get the idea! HOW: Go the same distance around each barrel, going the same direction circling from the outside in (inside out is another drill). Some horses will try and drift off, others cut in so it is your job to keep them on the track for a perfect circle keeping their body balanced throughout. This is a lot of work for the horse so don’t overdo it and only go as fast as you can do it correctly. Starting at a trot is a good warm up. You can work up to a gallop in between and a slower gathered lope in the turns. Depending on the horse I’m circling 10 to 20 feet off the barrels and they are about 50-55 feet apart in this picture. Don’t hesitate to go wider if you need to, to keep a perfect forward moving circle.